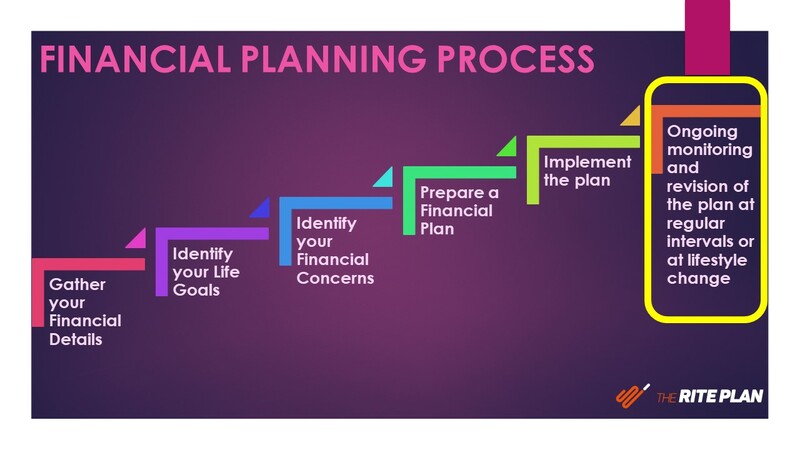 The Financial Planning Process has 6 broad steps with the last one focussing on the importance of monitoring and revision of the plan at the regular intervals. Let’s discuss why is it so important to regularly monitor your Financial Plan. Whenever your financial planner creates a financial plan for you, the planner takes data such as your income and monthly expenditure, your financial goals, your financial assets, etc. All these data points are expected to grow at an assumed rate of return to calculate the money you would require for your financial goals. Even the future inflation numbers have to be assumed. Though past data points are taken as reference points which helps a lot in achieving your goals, you cannot expect assumed calculations to hold true for all your life. Therefore, it is required that you review the calculations at least every year for your financial plan to stay true to its purpose i.e. achievement of all your financial goals. Your Lifestyle changes at every step of your life – it changes from your college days to when you start earning, it changes when you get married, it changes when you have kids, it changes when your kids start earning on their own and are no longer dependant on you. With the change in Lifestyle, your either start spending more or saving more depending upon the circumstances you are in. This changing Lifestyle has to be incorporated in your Financial Plan because it can have a huge impact on your financial goals primarily retirement planning. Hence, it is required to review your Financial Plan on regular basis to monitor the change in your lifestyle. All of us have once in a lifetime wish – it could be a luxury car, or a lavish vacation, or anything under the sun. But sometimes this financial goal/desire fades with time. Some financial goals lose their relevance with time. It is important to understand the validity and necessity of your financial goals while reviewing your financial plan. So, reviewing your financial plan is like doing a reality check on your future financial goals. Markets have become very volatile in recent times. Even the Global events have an impact on the Indian stock markets which ultimately affects your portfolio. To keep a check that whether the funds you have invested in are giving you desired returns or not, it is very important to monitor their performance on regular basis. Since Investment Planning is a part of financial planning, your financial planner can review your investments along with the Financial Plan review. It can help you reallocate your portfolio towards performing funds and help you achieve your financial goals within desired timelines. Most of the times, the query which we receive on out DIY online financial planning portal www.theriteplan.com is – for how long should we stick to this financial plan? Is it good enough to continue for another 5 years? But the answer is NO. You have to monitor your Financial Plan and investments on regular basis. By regular, I don’t mean every week or every month – it should be at least once a year or depending upon your life situations – lifestyle changes, salary hike, change in family structure, job relocation, etc. Basically, your financial plan has to be reviewed if there is any change in your life which affects the monetary aspect of your life as well. Only then you can expect your Financial Plan to work towards the achievement of your Financial Goals.